The x-ray helps in diagnosis only when bone absorption is prominent; sometimes when additional calcium has been deposited. Positive roentgenograms of the situation are therefore few. Figure 43, which faces p. 87, shows how little is the amount of cancellated as opposed to petrous bone to be seen about an adult molar in the lower mandible. When now it is recalled that the already meager blood supply to those petrous portions arrives via the cancelleted, it becomes apparent why even slight injury thereto threatens the life of all jaw substance distal to a root tip. In the clinical instance then, matters are usually worse. “Infected residual bone requires removal! Toward this end, how far may and must the operator go? The answer is, at least to the level of the ‘true’ bone constituting the maxillae proper. And in making such attack, what should be the design of his operation? Commonly the dentist ‘trenches’ the lower or upper jaw, meaning that he removes first the cancellated portions of these structures to leave the petrous walls standing. He should, on the contrary, remove these petrous portions (including the interdental) first, rounding off the medullary portion, as it were. The situation is portrayed diagrammatically in Fig 43 facing p 87. There is no purpose even in saving reflected periosteum – it is better destroyed, for when saved, any ‘regeneration’ of bone that is likely to appear from it is of exostotic variety, probably infected and at all times useless. Its salvation has in our experience only proved earlier notice that another operation for removal of bone would be required. 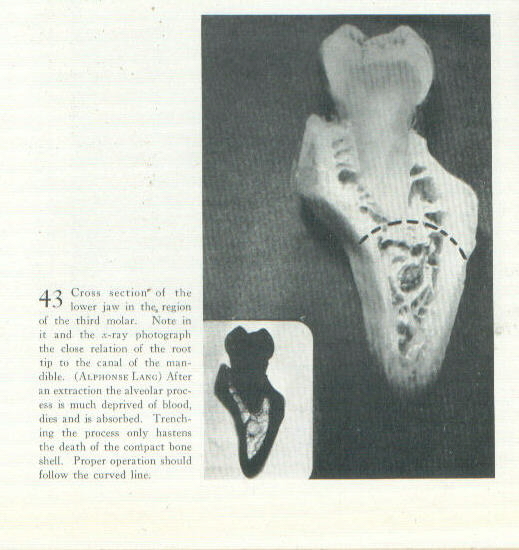 * For further information on the need to remove alveolar bone following extraction, please see Death and Dentistry, 1940, by Martin Fischer MD, particularly pages: 52-3, 56, 61, 64, 77, 80, 86-7, 112, 116-120, 135-7, 140, 146-8, 152, 161-3, 171, 173, 180-6. Copyright 1996-2010 S H Shakman, Institute Of Science. All rights reserved.